It's festival time for my fourth graders and hot lunch day for Faith. Ben is doing good to have a lunch today. Thank God for a freezer stash of food. 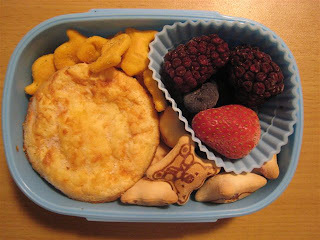 Ben took a homemade quiche, a few goldfish, koala cookies, strawberry/blueberry/blackberry, and a side container of yogurt (not shown). The fruit & quiches were in the freezer, though I'm in need of whipping up a batch of quiche or muffins or something quite soon. Did you bake the quiche in cupcake liners or in a cupcake tin? That is a great idea. I have a super picky 14 year old daughter who is so into "what other people think" that she is weird about her school lunch. However, at home she wolfs down more than her 21 year old brother. Go figure.